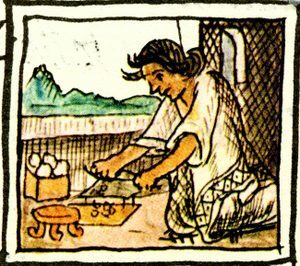 This drawing from the Florentine Codex, a 12-volume compendium of indigenous Aztec (Mexica) customs written by Bernadino de Sahagún between 1540 and 1585, shows a woman grinding corn with a metate and metapil. 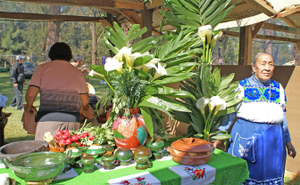 For four days in early December, 2007, the city of Morelia focused its attention on the cuisine of its largest indigenous people, the Purhépecha. Government officials and people important in the world of Mexican food arrived from points east and west. They heard seminars, book presentations, and studious commentary about the origins of mestizo cooking in Michoacán. Speakers emphasized the importance of keeping the strong cultural traditions of the Michoacán kitchen, the grand patrimony of family cookbooks, and the need to study and record the heritage of the various culinary regions of the state. 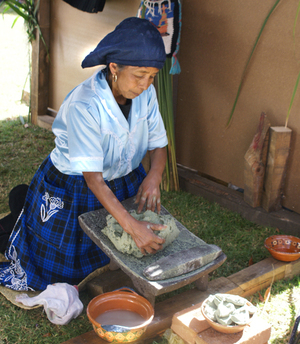 More than 460 years after Sahagún wrote the Codex, this Purhépecha woman grinds masa on the lawn at the Muestra de Gastronomía, still using a metate (the sloping three-legged grinding stone)and metapil, which resembles a rolling pin. We looked wise and nodded sagely as we heard scholarly talks. We of the press photographed all the bigwigs, who smiled politely and acquiesced. In truth, the press, the bigwigs, and Morelia's hungry citizens were waiting for only one thing: the Saturday opening of the Muestra de Gastronomía, the two-day food tasting that would give all of us an opportunity to sample the exquisite regional cuisines we'd been theorizing about for the first two days of this annual event. After all, food is what this annual event celebrates. Food is what fuels us, what feeds our bodies and our passions. Food kindles both our present day and our nostalgic past, and this encuentro (encounter) of tradition with today can bring together the best of both times. In the hands of las mayoras (the Purhépecha home cooks, elderly women all) and the young alta cocina (haute cuisine) chefs of Michoacán, we literally become one another's companions*: we break bread together and unite our hearts at table. *companion: From the Latin "Companionem," which was, "one with whom you would eat bread" -- "Con" (with) and "Pan" (bread) -- presumably, your "companion" was someone with whom you would "break bread." 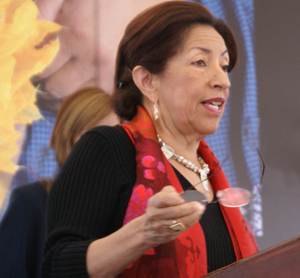 Gloria López Morales of Mexico City, formerly a long-term UNESCO and Conaculta official who continues to be a driving force in the conservation of Mexican gastronomy, comments about the importance of Mexico's cuisine as a cultural patrimony. To start our Saturday eating foray, we tried delicious tacos de borrego a la penca (lamb wrapped in agave leaves and pit-roasted), as prepared by Sr. Eduardo Garibay of Santa Clara del Cobre. Doña Paula Alfaro Aguilar (right) operates her eponymous restaurant, Doña Paulita, in Nuevo San Juan Parangaricutiro. She brought her special preparation of churipo to the Muestra de Gastronomía. 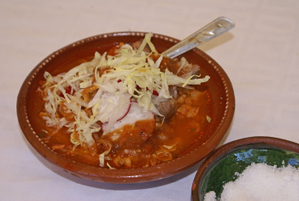 Churipo, native to Michoacán, is a soup made of beef, cabbage, onion, chile, and xoconostle, a sour tuna (fruit of the nopal cactus), among other ingredients. Michoacán pozole is made of pork (starting with the head and feet), nixtamal-ized corn, chiles guajillo and other spices, all simmered for hours over a wood fire. 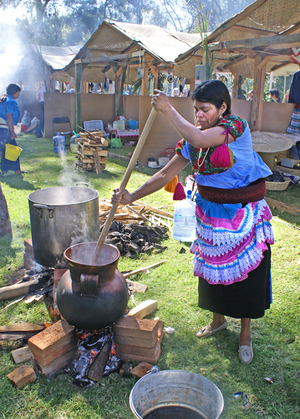 This woman stirs atole (a thick, usually sweetened corn drink), prepared in an olla de barro (clay pot) over a wood fire. 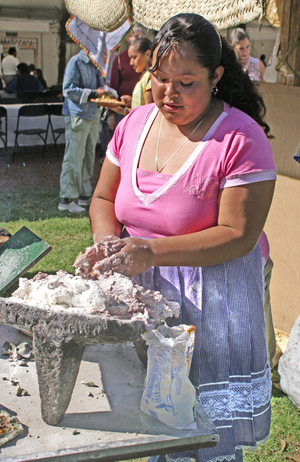 The next generation: Guadalupe Cielo Talavera Andrade of Tzurumútaro makes masa using a metate. A large percentage of the young people from Michoacán's Purhépecha villages has gone to work in the United States, leaving traditions behind and the future of the old ways in doubt. Tamales de zarzamora (blackberry tamales). In a large copper pot, bring the water to a boil. Add the 1/2 kilo prepared masa and simmer, stirring constantly, until the masa is dissolved and the liquid is thick. Grind 1/2 to 1 kilo fresh blackberries. Strain through a fine strainer to remove seeds. Simmer for 20 minutes in just a little water. Add the sugar to the strained blackberries and bring that mixture to a boil with the masa mixture. Cool slightly. Soak dried corn husks in warm water to soften. 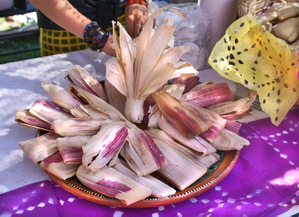 Using one or two husks per tamal, spread two or three tablespoonsful of the blackberry/masa mixture over the husks. Fold as for an ordinary tamal. Place the tamales in overlapping layers in a tamalera (tamal steamer) and steam for 30-45 minutes. Test for doneness. Charanda is typically Michoacán. 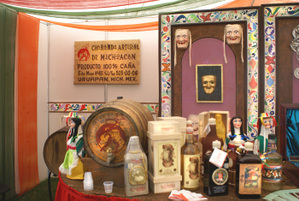 A product of Uruapan and its surrounding area, charanda is distilled from sugar cane and yeast. Clear charanda is approximately the same proof as tequila or rum. We used charanda as the piquete in our ponche navideño (Christmas punch). 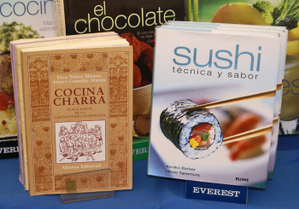 María Luísa R. de Obregón is the director of the bookstore "El Rincón de María Luísa, Donde las Letras Se Cocinan". Among many other volumes, she displayed these two books. One is about the traditional cocina charra (cowboy kitchen) and the other gives information about the techniques and flavors of sushi. Their juxtaposition is proof positive that in Mexico, the times are definitely changing. 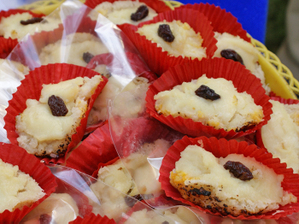 Cocadas (coconut candy) from Dulces Don Nacho of Uruapan. Regional sweets, including candied limones stuffed with sweetened coconut, rectangular bars of jamoncillo, balls of chile flavored sweetened tamarind paste, a whole candied squash (just left of lower center) and guava leather rolls stuffed with cajeta. 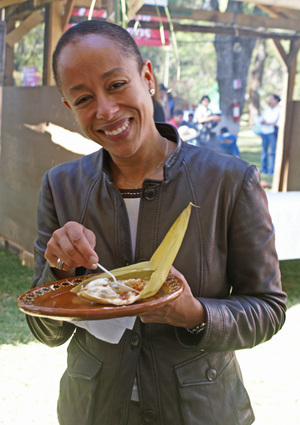 Mayra Coffigny de Cárdenas, director of the state social service agency Desarrollo Integral de la Familia (DIF, Whole Family Development) and the wife of Michoacán's governor Lázaro Cárdenas Batel, enjoys a tamal stuffed with picadillo, a mixture of meat, fruits and/or vegetables, and spices. 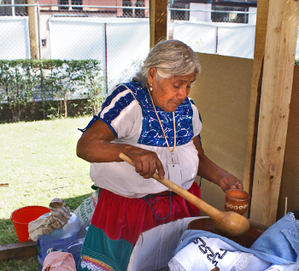 Doña Basilia Amezcua of Tarecuato prepared the prize-winning atole. Unlike most atoles, hers is a savory atole de habas (fava beans) seasoned with just a little chile jalapeño and hoja de aguacate (ground avocado leaves). The atole was so delicious that it won the prize for the second year in a row. I thought it was marvelous, so good that I purchased a liter to bring home. 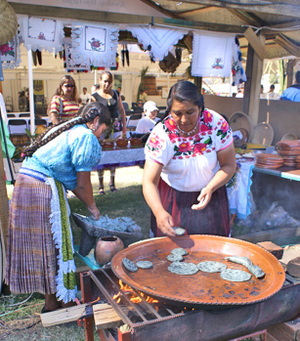 Benedita Vargas Alejo (right) and her assitant use a clay comal (griddle) to make blue corn tortillas, gorditas, and quesadillas. We see the Michoacán kitchen, with all its traditions and innovations, as an evolving work that needs to stick very close to its origins while it understands that transformation due to changing times--not simply current changes, but changes that have evolved across the centuries--are both valid and important. 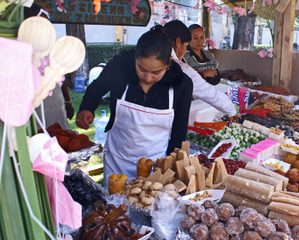 An event such as the Exposition and Muestra de Gastronomía acts as a guide for those who want to recognize the different origins of indigenous dishes and those that are of recent creation. Come to visit us in Michoacán! Few aspects of culture define a people more than its gastronomy. 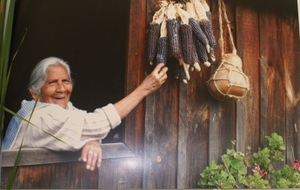 The four Encuentros sobre la Cocina Tradicional de Michoacán permit us to realize that eating isn't only a biological necessity but the enjoyment of good taste, social life, religious rituals, and the entire heritage of the indigenous Purhépecha in Michoacán. We hope that Mexico Cooks! will meet you at the next Encuentro de Gastronomía or similar event. 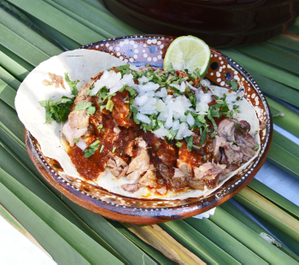 If you'd be interested in a taste of Michoacán, please contact us and we'll plan a trip for your pleasure. All photos and written material are property of Mexico Cooks! and may not be reproduced without prior permission. I agree with Tom. A magical event, and a wonderful description of it. I, too, hope to be there next December. What a fabulous article. I'm putting this event on my own calendar for next December. Also I want to track down more information about the Florentine Codex.